Greyhound Dog Statue. 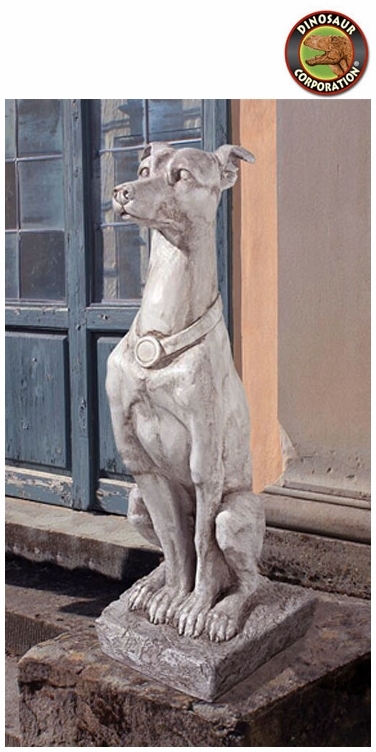 The muscular, aristocratic and quite beloved canine of the "rich and famous" is captured in a classic pose of this 1920's antique replica Italian greyhound dog sculpture which will perfectly elevate your garden or gallery. The fastest dog breed known to man is rendered in quality designer resin with an antique stone finish. * Size: 8�" W x 11" D x 30" H.
* Base: 8" W x 10" D x 2�" H.